As a child he grew up in a working-class environment - his father was a shoemaker - and attended primary schools in Evaton. He matriculated at St Peter's Secondary School in Johannesburg. (This was probably the Anglican school situated in Rosettenville, and not the school of the same name at Crown Mines.) Nokwe then proceeded to the South African Native College (University of Fort Hare) where he obtained a B.Sc. degree in 1949 and a teacher's diploma a year later. In 1951 he started teaching in Krugersdorp at the secondary school for Africans. Nokwe became acquainted with politics early in his life. One of his teachers in Johannesburg was Oliver Tambo, a leader of the African National Congress Youth League (CYL), who probably influenced him. Nokwe was involved with the formation of a CYL branch at Fort Hare and, after his return to the Transvaal, he remained an active CYL member, becoming chairperson of the Orlando branch in 1952. The following year he was suspended from teaching because of his participation in the Defiance Campaign, but obtained a post at a private school. In the second half of 1953 he accompanied Walter Sisulu, the secretary-general of the African National Congress (ANC), on a five-month tour overseas. They visited Britain, the Netherlands, Israel, the Soviet Union, the People's Republic of China and other socialist centres, including Bucharest in Rumania and Warsaw in Poland where they attended a youth festival and a youth congress respectively. After his return to South Africa he openly associated with the left wing of the ANC who co-operated with the South African Indian Congress (SAIC) and the South African Communist Party (SACP), including white communists. This increasingly led to antagonism from the Africanist in the ANC, especially P K Leballo, who believed in 'Africa for the Africans'. This opposition to closer ties with Indians and whites crystallised in the election of Leballo as chairperson of the Orlando branch of the CYL in Nokwe's place on March 1954. The tension between the Africanist and the CYL who tended towards multiracialism continued, and at the annual congress of the CYL Leballo's election as chairperson was not upheld. 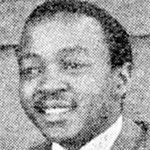 Nokwe was, however, elected as secretary-general of the national executive of the CYL, a position he retained until 1958. In 1955 he was elected to the national executive committee of the ANC, as well as secretary of the working committee. In 1958 he was elected as secretary-general of the ANC - a position he held until 1960. Within the ANC he was closely involved with the dissension between the Africanist and the supporters of the Freedom Charter - a document, which he had to defend against criticism, time and again. In 1954 Nokwe was restricted to Johannesburg for five years under the Suppression of Communism Act. The restriction was extended in 1959 for a further five years. Notwithstanding these banning orders Nokwe took part in resistance against the implementation of the Bantu Education Act (1953) in 1955. The bans served on him proved an obstacle in Nokwe's professional career. Through extramural study Nokwe obtained an LL.B degree at the University of the Witwatersrand, Johannesburg, in 1955 and qualified as an advocate. The Group Areas Act (1950) and Natives (Urban Areas) Act, however, prevented him from occupying rooms in the same building as other Johannesburg barristers. Furthermore, the restrictions prevented him from travelling freely to attend to clients and prepare for cases. He was one of the last 30 accused in the Treason Trial, in 1956 to 1961 and an unofficial member of the defence team. His own legal practice collapsed in this period. Nokwe was involved with the ANC's economic boycott in 1959, as well as the planning of an anti-pass campaign for 1959 to 1960. During the traumatic period after the Sharpeville shootings on 21 March 1960, which led to the declaration of a state of emergency by the government on 30 March and the banning of the ANC and the Pan-Africanist Congress on 8 April, the police detained Nokwe for five months. After his release he was a convener of the Consultative Conference of African Leaders in Orlando in December 1960. Although he could not attend the conference because of a banning order, he was elected to the continuation committee to organise an all-in African conference. This took place in March 1961 - although the unity at the conference soon broke down and the ANC dominated it. In the same month he was rearrested and found guilty of furthering the interests of a banned organisation under the Unlawful Organisations Act. A prison sentence was imposed upon him, but he appealed successfully against it. Nokwe left South Africa in 1963 and joined the ANC exile. He was intensely involved with campaigns to recruit support for the ANC and with attempts to affect a comprehensive economic boycott against South Africa. Ill health forced him to resign his position as secretary-general of the ANC in 1969. By 1974 he was again active in overseas opposition politics and, at the United Nations, he advocated that South Africa be suspended from that body. In 1975 he was appointed as deputy secretary-general as well as ANC director of international affairs. Periodically he broadcasted over the ANC's Radio Freedom. There was sometimes a talk that Nokwe was a member of the SACP. He was a zealous author and produced a number of political articles for newspapers and magazines. He was described as "tough, witty, urbane”¦one of the ANC's ablest politicians". He died after a short illness and was buried in Lusaka. His wife and children survived him. • New Dictionary of South African Biography, Pg 206-207.